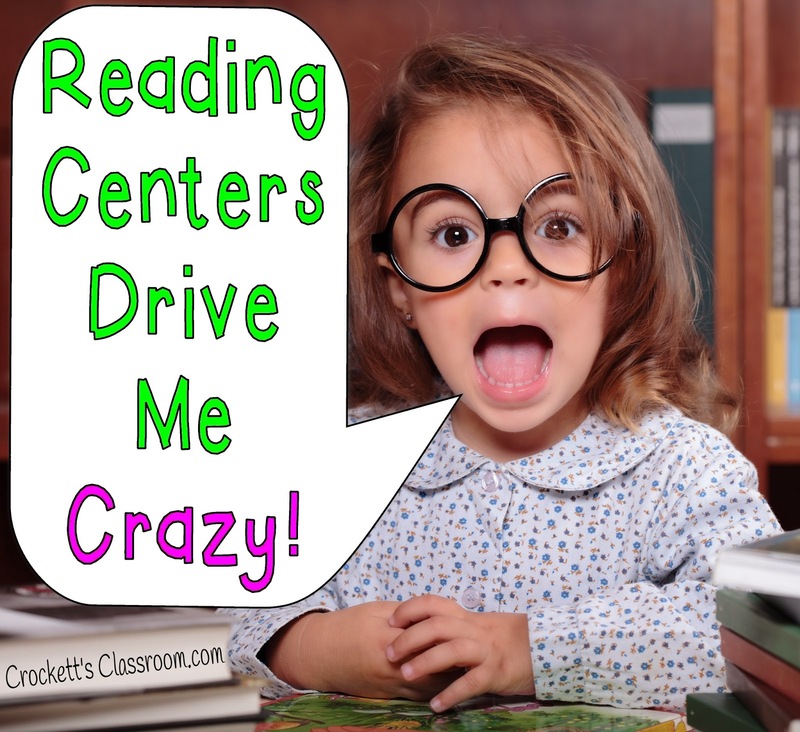 Reading Centers Drive Me Crazy! Too often, though, it turns into a nightmare to manage. I found myself spending way too much time making sure students were where they needed to be and doing what they should be doing. I wasn't able to give my attention to my small group. And then, there's the time it takes to prepare the centers every week and teach the kids what to do at each new center. I think the part that challenged me the most is coming up with centers that matched our curriculum and students were able to complete on their own without being just "busy work". Throughout my years as a classroom teacher I tried so many different systems, each with some success. But, I think what I saw in the second grade classroom of my friend, Mrs. Q, this week might have saved me a lot of headaches in my own classroom. Mrs. Q, like every other teacher I know, is overwhelmed with the demands being placed on her this year. The out-of-classroom demands keep increasing and this is affecting classroom instruction. So, Mrs. Q is trying to keep it simple. She's set up her small group/centers time in a way that will make the time valuable for the students and not take too much of her prep time. 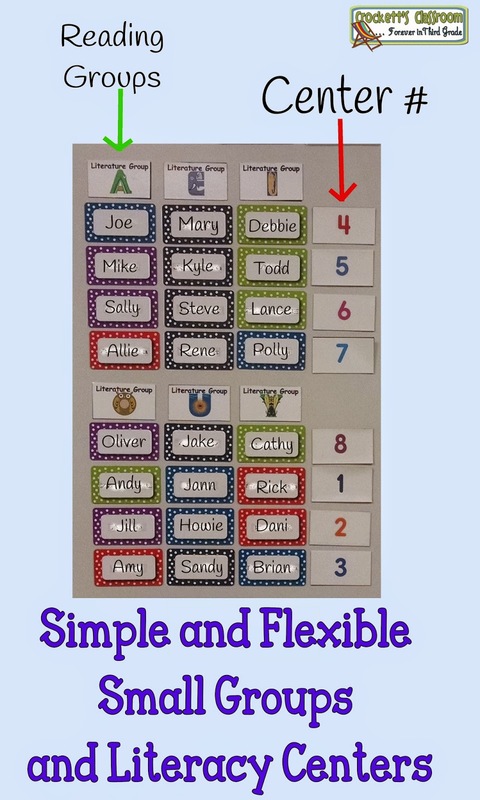 Plus the simplicity and flexibility will allow students to manage themselves so she can give her attention to the students in her small groups. I hope you'll find a few ideas that will help you bring some simplicity and peace to your teaching day! I'll try to explain how she has this organized. There are six reading groups. Each group has 4 students, grouped by ability. She calls reading groups when she wants to work with them. This board does not show which group works with the teacher because she calls groups when she needs them, not by a set schedule. She also has the flexibility to keep a group for just a few minutes or keep them longer, depending on their needs and her plans. When she calls a group, those kids stop what they're doing and join her at the reading table with their materials. So, through the week she will probably meet with the lower ability groups almost every day, while the higher groups will not meet with her as often. But, one of the great things about this is the flexibility. She can call a group to the table at any time for any reason. Another benefit is she can call students from different groups at the same time if she thinks they would benefit from the same instruction. Let's say she noticed that Mary, Amy, Jill, Brian and Mike all had trouble with contractions last week. She can easily have a little reteaching session with those students, even though they're from 5 different groups. On the right you'll see the eight center numbers. Students go to one center each day (Monday through Thursday). Friday is a "catch-up" day. So on this day, Joe, Mary and Debbie are scheduled for center #4. When they finish their seatwork (skill practice sheets) they can go to their center. If they finish their center they get a book to read or write in their journal. Since, working with the teacher at the reading table takes precedence over everything else, some students may not have time to complete their center for that day. That's what Catch-Up Fridays are for! On Friday they can go back to any of their centers from that week to finish their task. I spent a little time with Mrs. Q this week to help her prepare materials for the center activities she'll use during the 2nd Quarter. Since the students work through 4 centers a week, the eight centers will last for 2 weeks. We chose some activities because of they can be used more than once by the students. So, her center planning and prep is almost finished for the entire quarter! I've made some labels you can use to set up your own reading groups and centers. Click on the image to download them for your own classroom. My next few blog posts will focus on choosing literacy centers that are flexible, engaging and match your curriculum. So make sure you're following Crockett's Classroom!